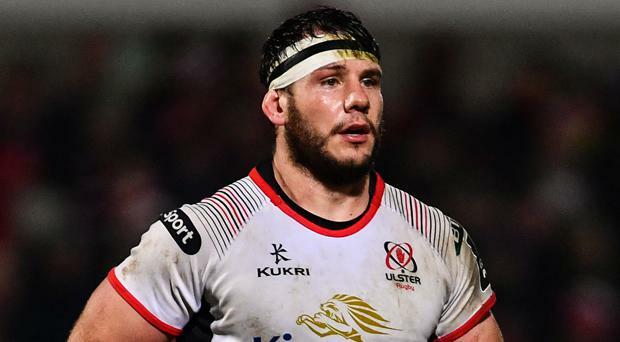 Marcell Coetzee has been named in Ulster's starting XV to host Southern Kings at Kingspan Stadium on Saturday (kick-off 5.30pm). Dan McFarland’s men are unbeaten in their last six matches in all competitions and they will hope to continue that recent good form as they battle for a play-off spot in Conference B.
Coetzee hasn't featured since the win over Leicester Tigers over two months ago but comes in as Ulster make five changes to the team that managed a bonus point win away to Dragons earlier this month. John Cooney is the only player available after Ireland duty but is limited to a place on the bench. Four of the new faces in the starting line-up are in the pack, with loosehead prop Andy Warwick, lock Ian Nagle and back rows Matty Rea and Coetzee all introduced. Warwick comes in as Eric O'Sullivan, who was named Man of the Match against Dragons, drops out of the squad. Nick Timoney shifts to openside flanker to accommodate number eight Coetzee while Kieran Treadwell and Clive Ross are on the bench and Jordi Murphy out of the panel. Rob Herring and Marty Moore will join Warwick in the front row, while captain Alan O’Connor partners Nagle in the second row. Nick Timoney, so impressive at Rodney Parade in his last outing, is named as the other loose forward. The only alteration to the backline is at scrumhalf, with Dave Shanahan coming in to partner Billy Burns at half back with Cooney named among the replacements. Stuart McCloskey and Darren Cave continue in midfield, and pacy wingers Rob Lyttle and Rob Baloucoune are again selected in the back three alongside Louis Ludik. John Andrew, Wiehahn Herbst and Tom O’Toole will provide front row cover on the bench, while Kieran Treadwell and Clive Ross are the other forward options. Cooney, Michael Lowry and Angus Kernohan, who helped Ireland U20s to a Six Nations Grand Slam success last weekend, are the backline replacements. Replacements (16-23): John Andrew, Wiehahn Herbst, Tom O’Toole, Kieran Treadwell, Clive Ross, John Cooney, Michael Lowry, Angus Kernohan. Johnny Sexton could come face-to-face with his younger brother Gerry in the PRO14 next season after the 26-year-old lock signed for the Southern Kings.